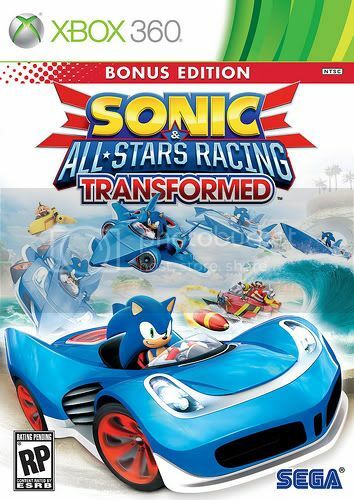 Recently, there was an interesting listing that was posted up on Amazon.com in regards to Sonic & All-Stars Racing Transformed for a “Bonus Edition”. Now, only days later, SEGA has announced it with details of what it comes with! The exclusive OutRun Bay track contains all the standard race modes found in Sonic & All-Stars Racing Transformed, plus challenges and time trials specific to the track. This time though, the whole race is transformed as you get to speed across the gorgeous shimmering blue ocean as well as the roads in a spectacular level inspired by SEGA’s classic arcade racer OutRun. Sonic the Hedgehog’s popular rival Metal Sonic explodes on to the tracks in the exclusive Metal Sonic Mod Pack in the Bonus Edition of the game; this prototype levitation vehicle was crafted purely to race – and race it must! In addition to the track and character, an Emoticon Sticker Pack can also be found in the Bonus Edition. These collectables are found throughout the game and are given as rewards for skilful play, high scores and more. Possibly our version of the Bonus Edition, with more chucked in? Once we find out what comes with the Limited Edition version, we’ll be sure to let you guys know first! What do you think about the contents of the Bonus Edition and the reveal of a “Limited Edition” version for Europe? Let us know in the comments!